I had been to the Swiss Alps once before, as a child during a family vacation, but that was almost 40 years ago. 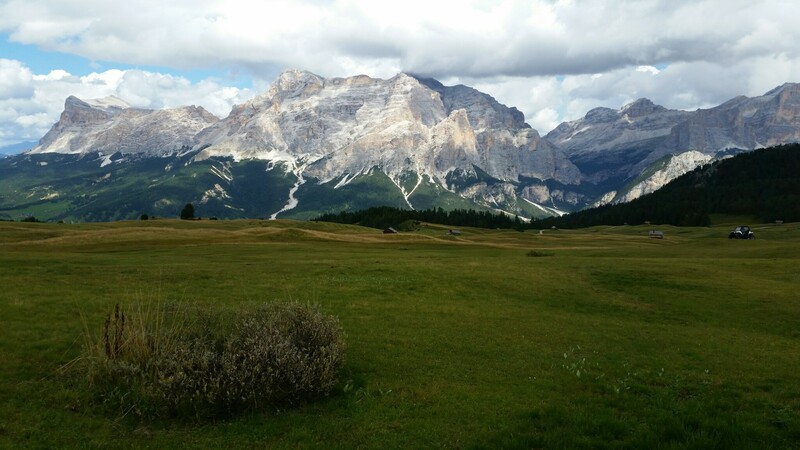 This summer it was finally time to repeat the experience, and together with wife and son, we headed to the Dolomites of northern Italy. After a long drive, we arrived in Corvara, a small ski town, situated high in a valley at 1,568 meters (5,144 feet) and surrounded by soaring mountain peaks. The temperature hovered in the 50s, and the weather alternated between bright sun and misty clouds with a light rain shower in the evening. After arriving late in the afternoon and getting in a ten-mile run with my son (keeping up as best I could), the next morning I set off to explore the trails. From town, the first trail headed straight up a ski slope to the mountain hut on top of Col Alt, which at 1,980 meters (6,496 feet) offers postcard views of the town and surrounding mountains. The climb was steep: 1,400 feet over 1.1 miles, for an average grade of 25%, and I averaged only 1.5 miles per hour. I didn’t make life any easier for myself by wandering off the trail (despite it being clearly marked) and heading straight up the ski slope through tall grass. 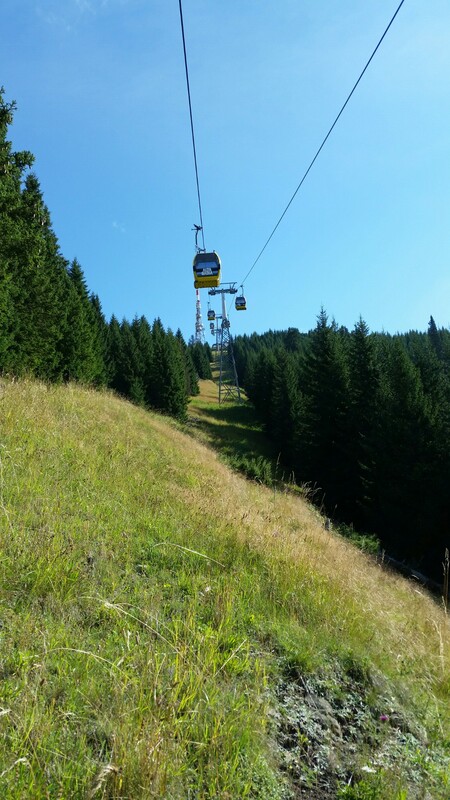 Having reached Col Alt, I discovered a broad plateau with rolling green meadows and a series of ski-lifts and mountain huts linked with groomed carriage roads. 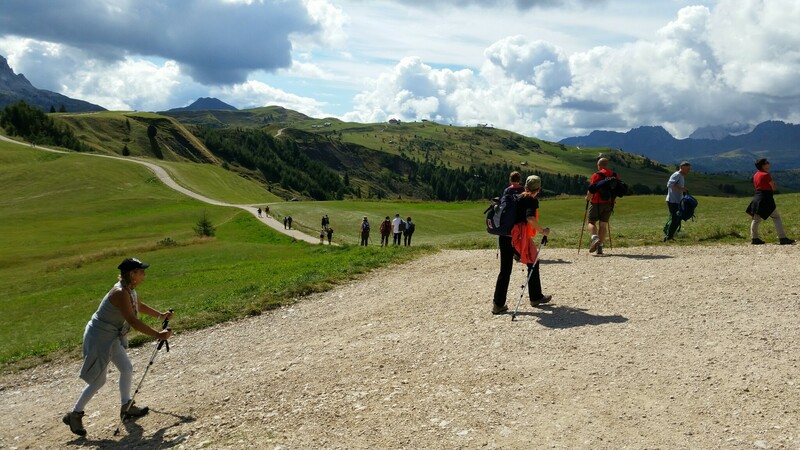 European tourists were out in droves, young and old, sauntering across the landscape with children and dogs in tow, or enjoying refreshments in the huts. I trotted along the roads heading south toward Col di Lana, a 2,462 meter (8,077) mountain peak I had picked for the day’s objective. As I proceeded further south, the carriage road deteriorated into muddy dirt track and then became a twisting path through limestone boulders. It was, however, very clearly blazed, and intersections were marked with wooden signs. The day remained clear, but clouds were building up across the southern horizon. I passed by the side of an enormous rock formation. Somewhere high above was Mount Setsas. The path picked its way through a talus field of sharp-edged boulders, and the going was slow. 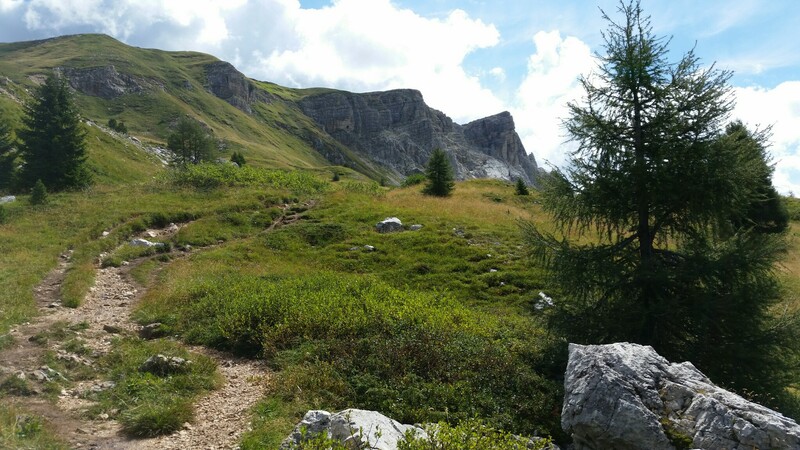 As I made my way around the base of Setsas, the peaks of Col di Seif and Col di Lana were soon in sight, but they still seemed far away, lying behind a saddle on the ridge, with a long climb to the top. The tourist hiking map in my possession was not drawn to scale, and it was going to take longer than expected to reach my objective. After a steep uphill climb, I made it to the top of Col di Sief to discover a cross, inscription, and panoramic views. 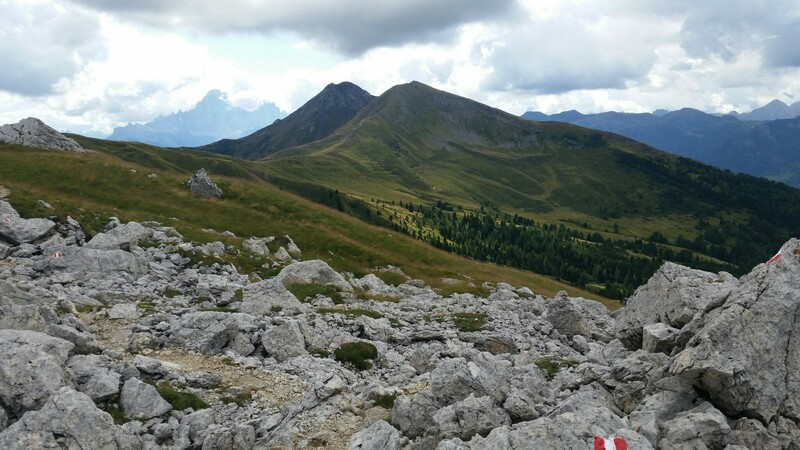 My objective, Col di Lana, was not far off, but the ridge between the two summits looked narrow and rocky. There was a group of hikers heading out in that direction, but I noticed they were wearing helmets and harnesses. I peered at the trail across the ridge, and it looked slippery and exposed. Meanwhile, the clouds were moving closer and the wind was picking up. Not properly equipped, I didn’t proceed any further. 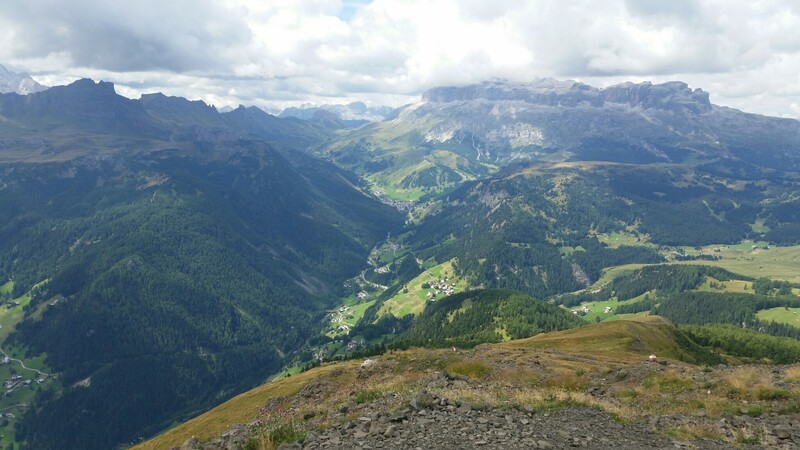 The views from Col di Sief were magnificent. I was glad I had made the trip. 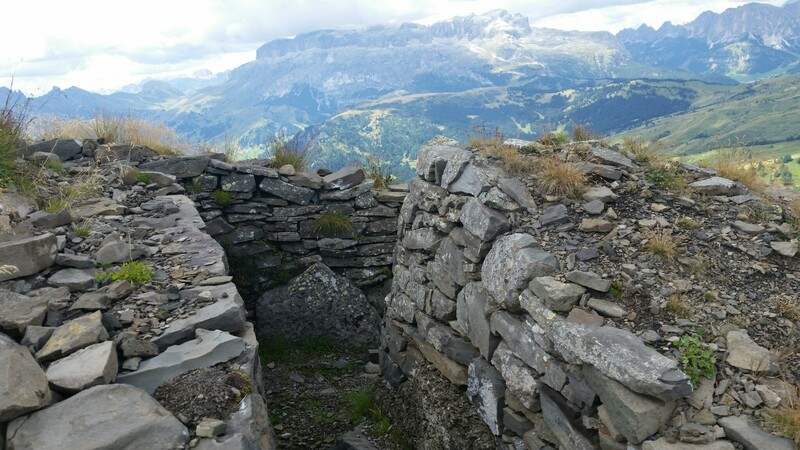 Another surprise on Col di Seif was entrenchments dating back to World War I, when Italians and Austrians battled over this mountain. The fighting was brutal, the winter weather was even more deadly, and the casualties ran into the thousands. In addition to small arms and artillery fire, both sides tunneled through the mountains and detonated mines. 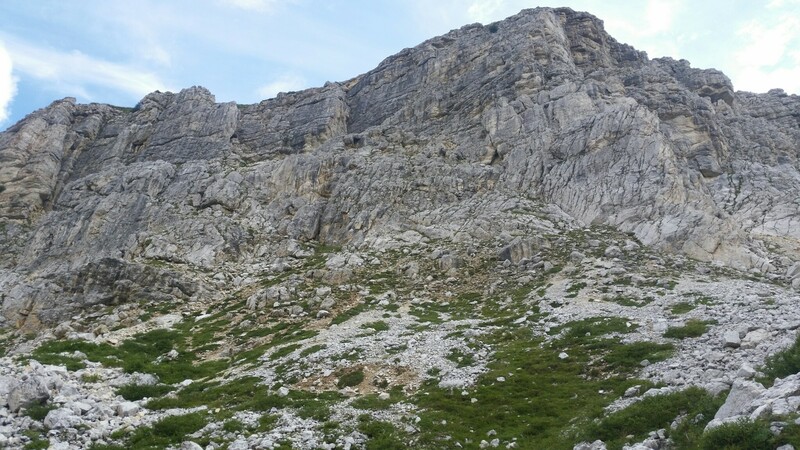 Apparently an Austrian mine destroyed part of the ridge connecting the two summits, leaving a jagged gash. 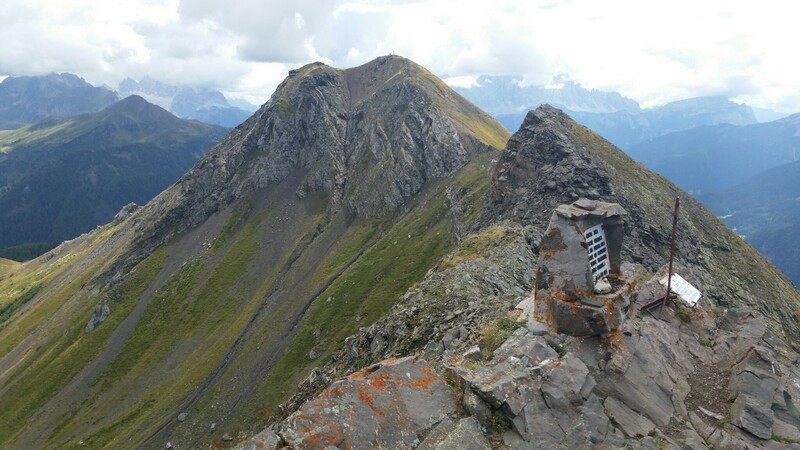 For all of these reasons, the Italians called Col di Lana, “the mountain of blood,” and both peaks today are sites of war memorials. The day’s trip lasted just under six hours and covered sixteen miles and about 4,000 feet of cumulative gain. On the way back, I enjoyed more views across the plateau, including to the northeast Lavarela (3,055 meters) and the Fanes, whose profile looks like the prow of a ship. To get back to town, I took a steep single track trail through spruce forests ending with a couple hundred feet of stairs carved into the side of the mountain, and it was great fun to hop down these stairs and finally arrive at the base again. My first day in the Alps in a very long time left me impressed with the scale of the mountains, the steep climbs, the expansive views across the plateau. But it wasn’t just the mountain landscape. 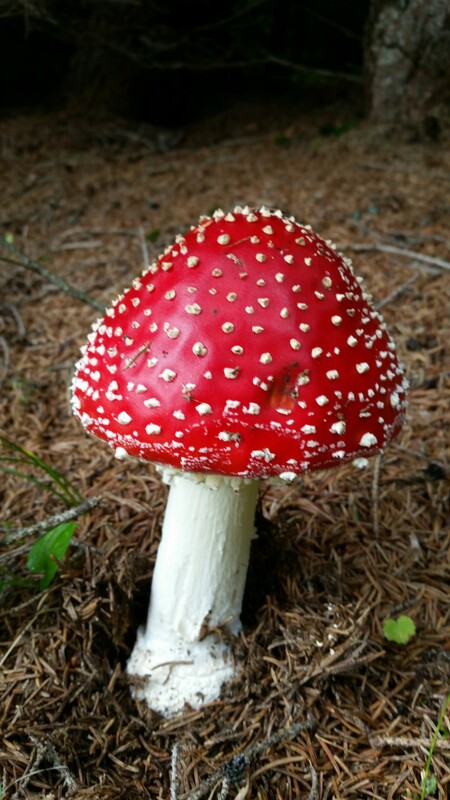 The forests were dark and quiet, and on the way down I discovered a colorful surprise hiding in the shadows. 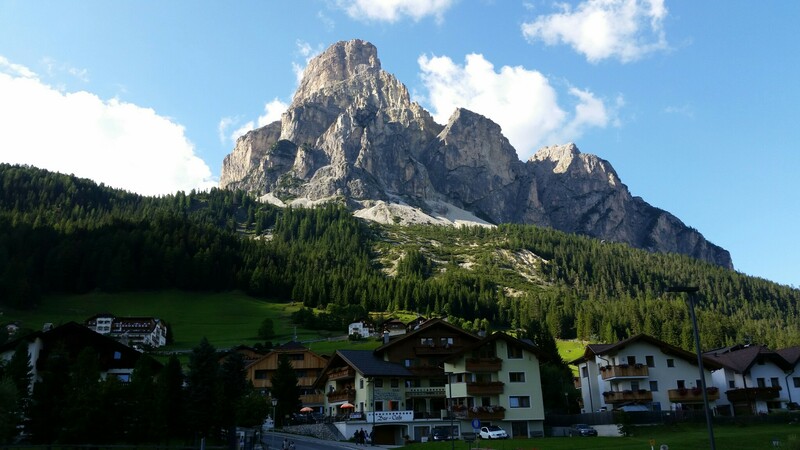 I suspect that the more time you could spend in the Dolomites, the more you’d find to like.